There is nothing quite like the disruption of a dental emergency. The unexpected trauma can happen anywhere, anytime, and if you decide to hold off on treatment, further damage can occur. A toothache is a common symptom of an infection. The infection will only grow if you don’t see an emergency dentist, and can potentially infect your gums, other teeth, and jawbone. In the most severe cases, the infection can travel to your bloodstream. Over-the-counter medication might temporarily relieve your toothache pain, but the actual cause of your pain will progress. The treatment for an infected tooth requires a root canal to remove all traces of the infection. Following the root canal, your tooth will also need to be sealed and further protected with a dental crown. A lost filling or crown can result in moderate to severe pain caused by sensitivity to pressure or temperature. Your crown or filling is meant to protect your teeth, so it needs to be replaced right away if lost or damaged. When you lose the protection of the filling or crown, you’re at risk of further tooth erosion – and tooth replacement is far costlier than a crown or filling replacement. 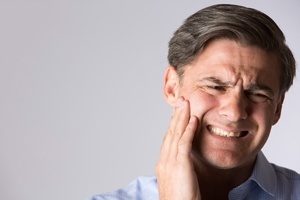 Certain trauma can cause your teeth to crack or even break. Untreated, the cracks can worsen and impact your ability to bite and chew food. In serious cases, broken teeth can require extensive dental restoration. Your cosmetic dentist may recommend composite fillings (bonding) or porcelain veneers to fix your cracked smile. Bonding is a convenient and cost-effective solution best suited for minor tooth damage. Veneers are a more permanent fix, with durable, stain-resistant porcelain lasting for 16-20 years with proper care. If you experience tooth trauma, contact your local emergency dental services provider in Marietta to have the affected tooth examined. The earlier you can receive treatment, the better. Early treatment can help lessen the extent of restorative dental care you need. Provide immediate relief to begin your dental emergency treatment, which may require a root canal, extraction, filling replacement, or crown to restore your tooth’s structure.